Amazon has been quietlybeefing up its own shipping logistics network lately. Although Amazon publicly says it’s meant to complement existing delivery partners like FedEx and UPS, a new report by The Wall Street Journal’s Greg Bensinger and Laura Stevens says Amazon has broader ambitions. Eventually, Amazon aims to build a full-scale shipping and logistics network that will not only ship products ordered from Amazon, but also will ship products for other retailers and consumers. Amazon recently hired former Uber VP Tim Collins as VP of global logistics. It recruited dozens of UPS and FedEx executives and hundreds of UPS employees in recent years. Test trials for last-mile deliveries are running in big cities like Los Angeles, Chicago, and Miami. The company also experimented with a program called „I Have Space“ to store Amazon’s inventory in warehouses owned by other companies. On top of that, InternetRetailer.com recently reported that Amazon has hired Ed Feitzinger, the former CEO of UTi Worldwide, one of the largest supply chain management companies, as VP of global logistics. Add that to the fact that Amazon has now built facilities within 20 miles of 44% of the US population, and Amazon is starting to look like a real threat to existing logistics networks. According to Baird Equity Research, Amazon is looking at a $400 billion market opportunity by launching all these initiatives. They could also help Amazon reduce some of its shipping costs, which have been increasing every year. People in the industry are starting to take notice, too, according to Zvi Schreiber, the CEO of Freightos, an online marketplace for international freight. „After dominating e-commerce and warehousing, Amazon is moving farther up the supply chain and eyeing the logistics sector from all angles, particularly looking to leverage technology, capital, and manpower to make logistics more efficient,“ Schreiber told Business Insider. Dieser Eintrag wurde veröffentlicht in Innovation, Innovatoren, Wirtschaft und getaggt mit amazon, FedEx, Jeff Bezos, UPS am 29. September 2016 von innovation. Amazon has a tendency to polarize people. On one hand, there is the ruthless, relentless, ferociously efficient company that’s building the Sears Roebuck of the 21st century. But on the other, there is the fact that almost 20 years after it was launched, it has yet to report a meaningful profit. This chart captures the contradiction pretty well—massive revenue growth, no profits, or so it would seem. But actually, neither of these lines gives you a good sense of what’s really going on. Amazon discloses revenue in three segments—Media, Electronics & General Merchandise (‘EGM’) and ‘Other’, which is mostly AWS. As this chart shows, these look very different (this and most of the following ones use ’TTM’—trailing 12 months, which smooths out the seasonal fluctuations and makes it easier to see the underlying trends). The media business is still growing, but it’s the general merchandise that has powered the explosion in revenue in the past few years. Meanwhile, the ‘Other’ line is growing but is still much smaller. This still doesn’t really give an accurate picture, though. Amazon is in fact organized not just in these segments, but in dozens and dozens of separate teams, each with their own internal P&L and a high degree of autonomy. So, say, shoes in Germany, electronics in France or makeup in the USA are all different teams. Each of these businesses, incidentally, sets its own prices. Meanwhile, all of these businesses are at different stages of maturity. Some are relatively old, and well established, and growing slower, and are profitable. Others are new startups building their business and losing money as they do so, like any other new business. Some are very profitable, and some sell at cost or at as loss-leaders to drive traffic and loyalty to the site. Books are a good example. There’s a widespread perception that Amazon sells books at a loss, but the average sales price actually seems to be very close to physical retailers—it discounts some books, but not all, and despite all the argument in the Agency lawsuits, quite how many and how much is (deliberately) as clear as mud. The tricky thing about these third party (‘3P’) sales is that Amazon only recognizes revenue from the services it provides to those companies, not the value of the goods sold. So if you buy a pair of shoes on Amazon from a third party, Amazon might collect payment through your Amazon account and ship them from its warehouse using its shipping partners—but only show the shipping and payment fees it charged to the shoe vendor as revenue. It does not disclose the gross revenue (‘GMV’). Given that (as it does disclose) third party sales tend to have a higher unit value, this means that the total value of goods that pass though Amazon with Amazon taking a percentage is perhaps double the revenue that Amazon actually reports. So, the revenue line is not really telling you what’s going on, and this is also one reason why gross margin is pretty misleading too. Gross profit has risen from 22.4% in 2011 to 27.2% in 2013, but this does not really reflect a change in consumer pricing and margins thereof, but rather this change in mix. If you listen closely, Amazon itself tells us this. The image below comes straight from Amazon—originally it was a napkin sketch by Jeff Bezos. Note that there’s no arrow pointing outwards labeled ‘take profits.’ This is a closed loop. In any case, profits as reported in the net income line are a pretty bad way to try to understand a business like this—actual cash flow is better. As the saying goes, profit is opinion but cash is a fact, and Amazon itself talks about cash flow, not net income (Enron, for obvious and nefarious reasons, was the other way around). Amazon focuses very much on free cash flow (FCF), but it’s very useful to look also at operating cash flow (OCF), which is simply what you get adding back capital expenditure (‘capex’). In effect, OCF is the bulk of running the business before the costs of the infrastructure, M&A and financing costs. This shows you the effect of selling at low prices. As we can see here, Amazon’s OCF margin has been very roughly stable for a decade, but the FCF has fallen, due to radically increased capex. In absolute terms, you can therefore see a business that is spinning out rapidly growing amounts of operating cash flow—over $5bn in the last 12 months—and ploughing it back into the business as capex. It’s pretty apparent that the money is going into more fulfillment capacity (warehouses, to put it crudely) and to AWS. Hence, this chart shows an enormous increase in Amazon’s physical infrastructure, as measured in square feet—this is almost all fulfillment rather than data centers, though Amazon no longer gives a split. The first two of these are straightforward investment in the future, often delivering higher future margins. AWS is a black box and a much debated puzzle, but it is also pretty much the definition of a new business that requires investment to grow. The real bear case here would be the last point— that the existing business is becoming more capex-intensive—that more dollars of capex are needed for every dollar of current revenue. Just to make life harder for those looking to understand Amazon’s financials, the warehouse expansion, capex expansion and AWS build-out all started at roughly the same time, and at that same moment Amazon changed the way it reports to make it very hard to pick them apart. Until 2010 it split both property and asset value between fulfillment and data centers, but at that point it stopped, probably not by coincidence (in 2010 Amazon had just 775,000 square feet for data centers and customer service combined). In the meantime, there are various metrics (capex per square foot, for example) that would show a shift of spending from cheap warehouse to expensive data centers—but they would also show a shift from maintaining existing warehouses to building new ones. So there is no direct, easy way we can see the split. We can still, though, get a something of a sense of the key warehouse question—has the business gotten more expensive to run? It looks like the answer is no. First, the third party sales do not seem to be the issue: ratio of 3P units has not gone up at anything like the way the capex/sales has over the same period (here’s that chart again). So, though we can’t be sure, it looks like the capex is not going up because Amazon’s existing business has become more expensive to run, but because Amazon is investing the growing pool of operation cash flow into the future. All of this brings us back to the beginning—Amazon’s business is delivering very rapid revenue growth but not accumulating any surplus cash or profits, because every penny of cash is being ploughed back into expanding the business further. But, this is not because any given business runs permanently at a loss—it is because the profits from what is already there are spent on making new businesses. In the past, that was mostly in operations, but in recent years the investment firehose has again been pointed at capex. How long will this investment go on for? Well, do we believe that the conversion of products and businesses to online commerce is finished? Let’s rebase that revenue chart, and look at it as share of US retail revenue. Excluding gasoline, food and things like timber and plants, all hard to ship, at least for now, Amazon has about 1%. Still, investors put their money into companies, Amazon and any other, with the expectation that at some point they will get cash out. With Amazon, Bezos is deferring that profit-producing, investor-rewarding day almost indefinitely into the future. This prompts the suggestion that Amazon is the world’s biggest ‘lifestyle business’—Bezos is running it for fun, not to deliver economic returns to shareholders, at least not any time soon. Dieser Eintrag wurde veröffentlicht in Innovation, Web, Web Development, Wirtschaft und getaggt mit amazon, Jeff Bezos, Web Development am 24. Oktober 2014 von innovation. Is Amazon A Giant Ponzi Scheme Dressed In Drag? The recent run-up in Amazon.com’s (NASDAQ:AMZN) stock price inspired me to revisit an old thorn in my side. AMZN is up 12.2% since the beginning of 2013, despite a very tough retail sales environment and despite the fact that California and some other states now collect what is known as „the Amazon tax.“ In addition, a bill to collect a Federal Internet sales tax was reintroduced in Congress two weeks ago: Online sales tax. With this in mind, I decided to peruse AMZN’s 2012 10-K, something I had not done in years, to see what was going beneath the headline „veneer“ applied heavily to AMZN’s quarterly sales and net income results. I knew that AMZN was using some controversial accounting methodologies, but when I pulled apart the financial statements and applied some old fashioned financial analysis, what I found with regard to AMZN’s cost structure, cash flow and true profitability was quite shocking. Looking at some income statements, cash flow from operations and balance sheet indicators, some of which Wall Street never discusses – AMZN looks somewhat like a Ponzi scheme. I say this because I believe it is likely that a serious cash problem for AMZN will develop if its sales growth slows down or even goes flat. Second, I believe a big part of the declining cash flow margin comes from AMZN’s cost of fulfillment – the cost delivering products to the end-buyer. I have always believed that AMZN’s business model generated tremendous sales growth because AMZN’s fulfillment strategy, in effect, heavily „subsidizes“ the all-in price paid by the customer. As you can see in (2) above, AMZN’s fulfillment costs have increased as a percent of its cost of goods sold in each of the last three years. In fact, the way AMZN accounts for fulfillment is quite controversial: AMZN’s accounting. AMZN does not include fulfillment costs in its cost of goods sold (COGS), despite the fact that shipping – getting sold products to the buyer – is an integral part of the all-in cost of products sold in AMZN’s business model/strategy. AMZN’s „holy grail“ is that it can sell products over the Internet more profitably than „brick and mortar“ retailers, so the cost of delivery should be part of the cost of sales. It’s a grey area of FASB rules, but not including this expense in the COGS distorts AMZN’s gross margins vs. that of competitors. 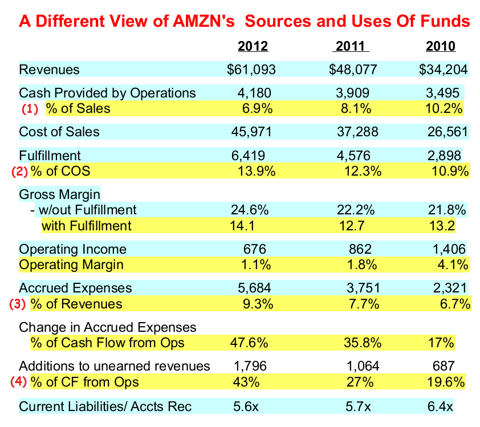 (2) in the table above shows AMZN’s gross margin with and without fulfillment costs. As you can see from the difference in the two metrics, AMZN is heavily incentivized to keep the cost of fulfillment out of its COGS calculation. Gross margin is a key metric for analyzing profitability. In 2012, Target’s (NYSE:TGT) gross margin was 31%, Wal-Mart’s (NYSE:WMT) was 25% and Best Buy’s (NYSE:BBY) was 24.6%. You can see why AMZN has refused to consider fulfillment costs as part of the cost of a product, despite the fact that it is a key component in generating revenue. Fulfillment costs have been a rising part of AMZN’s overall product cost. As the cost of energy, and there the cost of shipping, increases it will put even more of a squeeze on the cash margin AMZN earns with each sale. Third, AMZN’s operating margin is razor thin compared to its comparables. You can see from (3) in the table above that it’s been deteriorating quickly over the last three years. For 2012, TGT and WMT had operating margins of 7.6% and 5.6%, respectively. Remember, AMZN’s theory with its business model is that it can operate less expensively than its „brick and mortar“ rivals. The numbers for the last three years suggest that AMZN fails to deliver on this. Let’s now look a little more deeply at the cash being generated by AMZN’s operations and why I believe AMZN resembles more of a Ponzi scheme than people realize. In addition to cash being generated by sales, „cash provided by operations“ also includes changes in working capital. Inventory is a use of cash; accounts receivable, accounts payable and other current liability accruals are sources of cash. Retailers tend to have a much larger amount of accounts payable than they do receivables. Cash comes immediately from sales and companies negotiate payment terms from vendors, etc, thereby giving retailers the „float“ on cash generated by operations. In order for this model to work, it is important for sales to grow over time, as the „velocity“ of „cash in“ needs to stay ahead of the velocity of „cash out,“ otherwise a liquidity problem can develop. I chose to isolate and focus on AMZN’s accrued expenses because the payables have been increasing at a normal rate. However, the accrued expense account (3) has been increasingly a significant portion of AMZN’s „cash provided by operations,“ – its „cash in.“ As you can see from the table above, accrued expenses are growing and have gone from just 17% of cash flow from operations to over 47%. This is a big red flag. Accrued expenses are largely cash from the sale of gift cards. If gift cards go unused, and some do, they accrue 100% to operating income. AMZN doesn’t disclose the other sources of accrued expenses, but it isolates „unearned revenues“ in its cash flow statement (4) – this is gift card cash. As you can see, gift card sales have been a growing source of cash funding over the last three years, representing 43% of cash generated by operations in 2012. If I didn’t know exactly what business AMZN was in, I would be under the impression that it was trying to become a gift card sales operation. My point here is that – at 43% of cash generated by operations – AMZN is become increasingly reliant on the „float“ it gets from gift cards in order to fund its operations on a short term basis. If AMZN’s revenues slow down or its expenses unexpectedly increase, for whatever reason, AMZN could face liquidity problems. What happens if sales slow down because of a bad economy or predatory competitors? On Monday (March 3) Wal-Mart announced that it was going to start going after AMZN’s „Marketplace“ web vendor business: Wal-Mart/Amazon. This will likely „cannibalize“ AMZN’s „net service sales,“ which has gone from 10% of revenues to nearly 15% over the last three years. AMZN doesn’t break out its income from its revenue segments, but its Marketplace business is likely very high margin, meaning it’s become an important part of cash generated by operations. In addition, the imposition of the internet „Amazon tax“ will increase the customer’s all-in cost to buy from AMZN, which could significantly impact sales negatively. AMZN’s market cap as of the 3/7/2013 close is $124.5 billion. Based on 2012 operating income, it’s trading at 185x operating income. For comparison purposes, WMT and TGT trade respectively at 9.2x and 8x their 2012 operating income. The p/e comparison is irrelevant because AMZN lost money on a net income basis in 2012, but that multiple of cash flow unequivocally represents an irrational „bubble“ valuation. AMZN’s market cap has always been one of the unsolved mysteries of the stock market. Moreover, in its entire operating history, AMZN has never generated meaningful income or cash flow. It is clearly highly overvalued relative to its peers. But, I have rarely made money either shorting the stock or buying puts. It’s been a long-time source of frustration and at this point I’m going to wait until I see the signs that the Ponzi-like cash funding scheme AMZN has in place starts to deteriorate and then I’m going to pounce hard on the short side. Given that retail sales seem to be slowing down – and by some metrics declining – with the economy, and given that Wal-Mart is going to start throwing its weight around at one of AMZN’s key sources of cash flow, I don’t think I’ll have to wait much longer. Dieser Eintrag wurde veröffentlicht in Innovatoren, Kreativität, Web, Web Development, Wirtschaft und getaggt mit amazon, business model, Jeff Bezos, operating income, Ponzi scheme am 24. Oktober 2014 von innovation.